Question: Exactly what is NECC? Answer: NECC Motorsports (NECC) is the Northeast Corvair Council, Inc., a not-for-profit corporation registered in the State of New Jersey. NECC conducts performance driving events for all makes and models of cars. Question: Is NECC a racing club? Answer: No. While it is true that NECC organizes time trials and other track events, our rules prohibit wheel-to-wheel competition. Safety is our top priority. Question: When was NECC established? Answer: NECC was established in 1974 and has been active continuously ever since. For many years, NECC held time trials for Corvairs at Lime Rock Park in Connecticut. Now, NECC holds performance driving events for all makes and models of cars at different tracks around the country. Answer: NECC is managed and financed by a number of member clubs, each a regional chapter of the Corvair Society of America, Inc. (CORSA). The member clubs pay dues and have representatives on NECC's Board of Directors. The member clubs are: Bay State Corvairs, Bayshore Corvair Association, Blue Mountain Corvair Club, Capital District Corvair Club, Central New Hampshire Corvair Club, Connecticut CORSA, Connecticut Valley Corvair Club, Lehigh Valley Corvair Club, Long Island Corvair Association, and the New Jersey Association of Corvair Enthusiasts. CORSA hosts our website and we thank them for it! Question: Are NECC events open to cars other than Corvairs? Answer: Yes, most certainly! Over the years, we've opened up our track events not only to Corvairs but also other makes of cars. 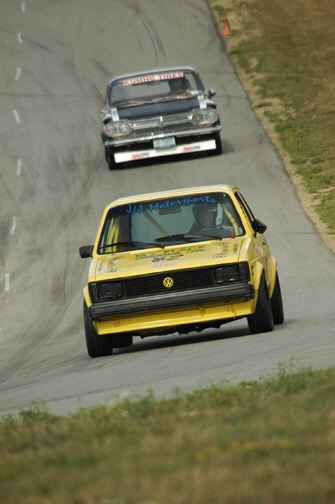 Our starting grid often includes Porsches, Mazdas, Mustangs, Camaros, Mini Coopers and more. At our time trials, lap times are recorded for all cars. Drivers of all cars are treated equally with respect to safety requirements, driving rules, tech inspection, track time, etc. Question: Can I participate in NECC events? Answer: Yes you can! Participation is open to any and all cars and drivers who pay our registration fees and conform to our rules and regulations, all of which are posted on this website. Get on the NECC mailing list. Send your U.S. Postal address to our registrar, John Ryall, at jryall@juno.com.